Each package contains 3 bags. 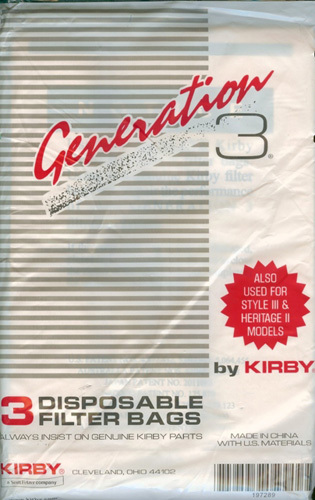 Genuine Kirby bags are tested for optimum performance for you Kirby Home Care System. Samples of each batch of bags are filled to maximum capacity with talc and stress tested 1,000 to 10,000 cycles to assure joints and seams will not tear during use. All our bags must pass the stress test or the whole batch is rejected. Enjoy the performance of your Kirby Home Care System with complete confidence because our products are manufactured and tested to exceed your expectations.